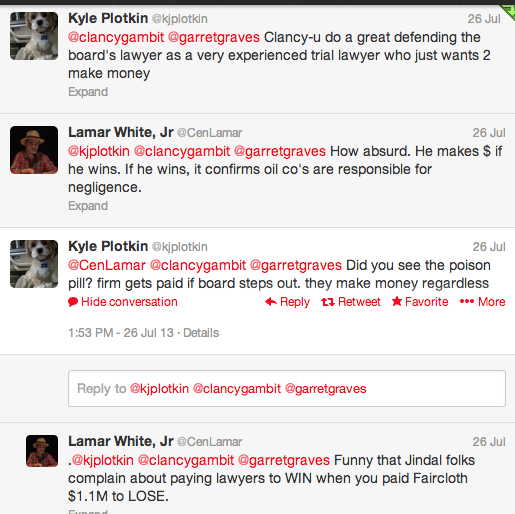 Governor Jindal, in doing the bidding of the oil and gas industry, failed to mention that the only way these “trial lawyers” could make a significant amount of money from this litigation is if they win. And if they win, Louisiana stands to gain billions that would be used for coastal restoration. If they lose the case, they make nothing. And if, for some political reason, the lawyers, whose contract was unanimously approved by the authority, are forced to abandon the lawsuit, they can only be compensated for the work they’ve already done. It’s a standard contingency fee agreement. Governor Jindal’s contemptuous comments about “trial lawyers” not only reflect a cynical politicization of the most critical issue in Louisiana, they also promote an insidious and ignorant disdain for the rule of law, the legal profession, and the judicial process. Faircloth returned to private practice with his new law firm, and within three months of the election loss, in January 2010, he was hired to represent the Louisiana Tax Commission, led by Jindal appointees. He canceled the legal services contract a few months later, after questions were raised about whether he had waited enough time under the law to do the work. The governor’s executive counsel is among those public employees prohibited from entering into state contracts for a year after leaving the job under Louisiana’s ethics laws. At the time, Faircloth said he didn’t believe the tax commission contract was prohibited, but he was later fined $1,000 by the Board of Ethics for violating the law. The fine was suspended as long as Faircloth remained in compliance with ethics laws. Before becoming executive counsel this year to Gov. Bobby Jindal, Alexandria lawyer Jimmy Faircloth was a key figure in a high-risk business venture that is sparking new controversy in a Louisiana Indian tribe still shaken after becoming the victim of a national scandal. 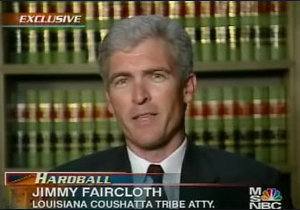 From 2005 to 2007, Faircloth advised the Coushatta Indians to invest $30 million in a formerly bankrupt Israeli technology firm called MainNet, which so far has shown no financial return for the tribe and is dependent on monthly installments of Coushatta cash. The company also hired Faircloth’s brother, on the attorney’s suggestion, after the tribe began investing. In the most recent Associated Press article about Mr. Faircloth, both Faircloth himself and members of the Jindal administration reference his considerable legal acumen as justification for awarding him no-bid contracts. And while Mr. Faircloth may, in fact, be a skilled lawyer, the truth is that he has been on the losing end of practically every single high-profile case he’s litigated on behalf of the Jindal administration. But, in fairness, that’s not the real issue. Within the span of only three years, Jimmy Faircloth went from making less than $200,000 a year as Governor Jindal’s executive counsel to making more than $1.1 million a year representing Governor Jindal and his administration as a private attorney. It’s staggering. Make no mistake: I’m not suggesting or implying that Mr. Faircloth has ever engaged in anything illegal. I don’t fault him for being savvy or financially successful. I do, however, think that his no-bid legal contracts deserve scrutiny, and at the very least, they represent the Jindal administration’s fundamental hypocrisy on the issue of “trial lawyers” who make “windfall” profits on the public dole. “By filing this suit against nearly 100 companies, the SLFPAE has effectively taken on the role of the governor, the attorney general, the Department of Natural Resources and the CPRA in determining the state’s policy on coastal issues,” the release said. “The governor did not approve this contract — nor would he have approved this contract,” the release said. In a statement responding to Jindal, Barry defended the authority’s action in filing the lawsuit and challenged the governor’s allegation that it had been improperly influenced by trial lawyers. When asked if the governor’s office advised agencies to contract with Faircloth for legal work or sought to steer work in his direction, Jindal spokesman Sean Lansing initially said no. He said the governor’s office doesn’t direct agencies to hire specific attorneys. Told that others spoke of Jindal’s office suggesting Faircloth’s firm for the education cases, Lansing later revised his response. “We have recommended Jimmy in certain circumstances because he is a great lawyer, but at the end of the day, it is up to agency heads to decide on the lawyer who represents them,” he said. Don’t know if it is legal, but it sure does smell quite a bit. The success of red sole shoes became more profound in 1980, when the company already occupied all four floors of the Manhattan building where it was located.